We recently ended up with a bottle of Kahlua and Irish Cream, I’m not one for drinking so I enjoy cooking with alcohol. Since I can’t have dairy anymore I pretty much have to make my own junk food to get what I want so here are some things I made in the last week. I adapted the recipe from the book Prohibition Bakery, its a chocolate espresso cake with chocolate Irish Cream filling and a Kahlua frosting. In place of butter I used coconut oil, in place of sour cream I used almond yogurt and in place of heavy cream I used coconut cream. In place of regular Irish Cream, substitute for dairy-free Almond Bailey’s. All of my changes were in equal parts. For the espresso I used a local and very good craft coffee company that I love called Anchorhead. It was a success except the frosting was more of a glaze. The alcohol thinned out the coconut cream more than I anticipated. I’ll have to figure out a good vegan frosting for next time. Basic from scratch cocoa recipe with a shot of Kahlua. From scratch cocoa tastes better than any packet of cocoa mix I have ever had. In a small saucepan add the cocoa, sugar and salt to 1/3 cup boiling water. Bring mixture to a slow boil and simmer for 2 minutes while stirring, be careful not to scorch it. Stir in milk and heat until very hot but not boiling. Remove from heat and add vanilla. I generally add 1 oz of the kahlua to the individual cups after they are poured. Got a few requests this week, here’s what I am up to this evening. Mix all ingredients together and then pour onto dropper bottles. Mix well, (don’t forget to add the preservative of your choice) place in wide rimmed container or 4 oz canning jars. The coffee and pumpkin pie spices takes a few days to defuse into the coconut oil. When that happens a wonderful scent develops. A problem I have with coffee scrub is it looks like the yummiest cake batter you have ever seen when you mix it. I made a lot of cookies this holiday season but these were the ones I liked the best, I also built the recipe from scratch because I didn’t have almond extract and I wanted to use up my maple sugar. purposefully went halves on the sugars and the oils because I wanted the flavor blend. 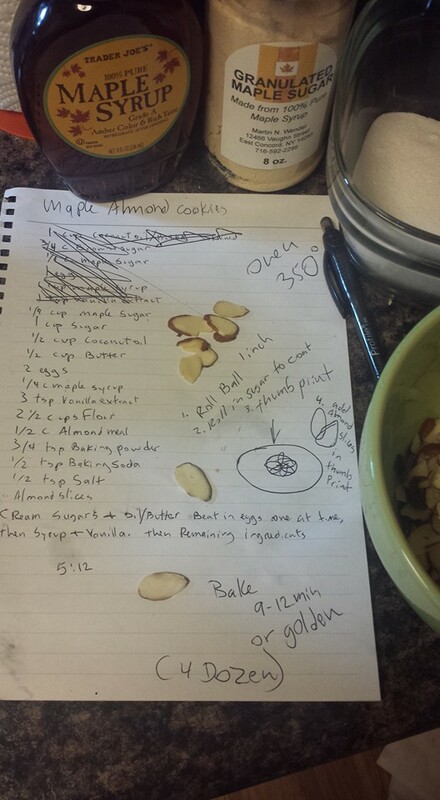 Added almond meal to boost the almond flavor but not too much as to jeopardize the integrity of the cookie. Cream the sugars with the coconut oil and butter. beat in 1 egg at a time followed by the syrup and the vanilla, add remaining ingredients except for the almond slices extra sugar and mix until well incorporated. Roll dough into 1 inch balls then roll in sugar, place on cookie sheet and press gently down in the center to make an indent, add 3-5 pieces of almond to the center indent. bake 9-12 minutes or until golden, makes about 4 dozen crunchy little bite sized cookies.